Wood frog tadpoles affected by ranavirus. BRUNSWICK, Maine — One of North America's most common species of frog could be under threat. 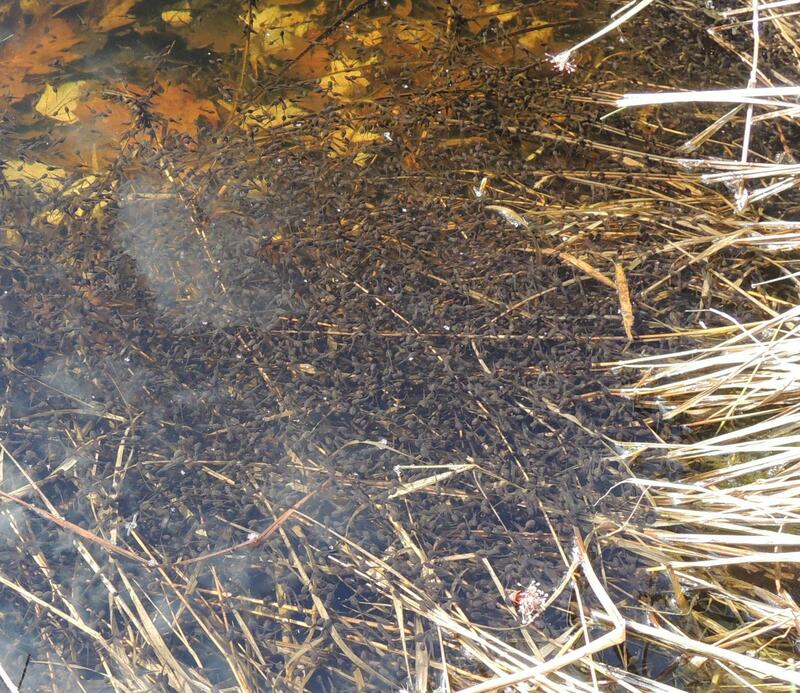 A Maine biology professor has uncovered worrying evidence of a mass die-off of wood frog tadpoles. And it all happened virtually on his own doorstep, just a few short steps from his house. Tom Porter reports on wood frogs. "The wood frog is something that cheers me up every early April when there's still snow on the ground and ice in the center of the pond." says Nat Wheelwright, professor of biology at Bowdoin College. "The wood frogs come out of their little holes where they've spent the winter and the males get there first, and literally thousands and thousands of frogs converge on this pond. There's a cacophony of ducklike quacks all night long." 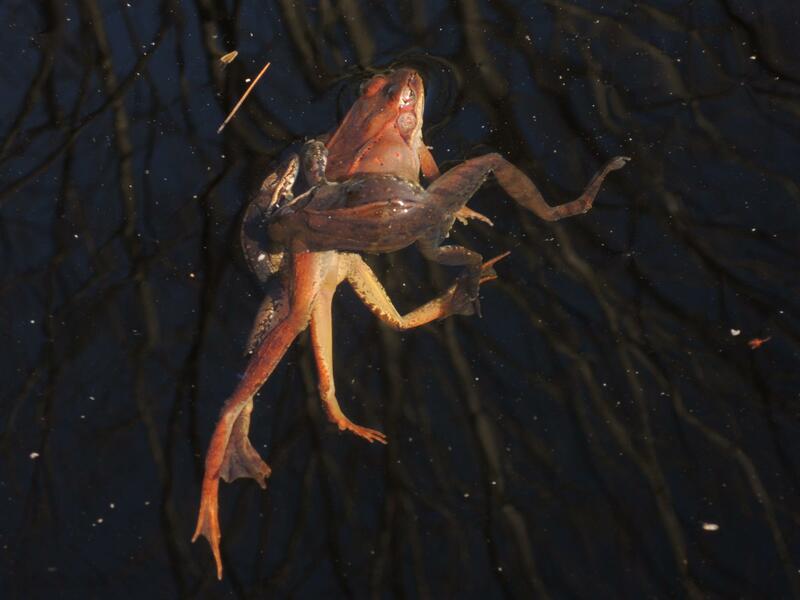 That cacophony of quacks, at the pond behind Wheelwright's house in Brunswick, goes on for 3 or 4 nights as the wood frogs embark on an explosive 3-day breeding frenzy in the water every Spring. Then, as quickly as they appeared, they go back into the woods, leaving their eggs behind to hatch into tadpoles, which then turn into frogs in early August. Wheelwright — often with the help of his students — has been monitoring for frog activity here for the past 28 years. Last summer, he says, they witnessed a disturbing event — something he had never seen before. 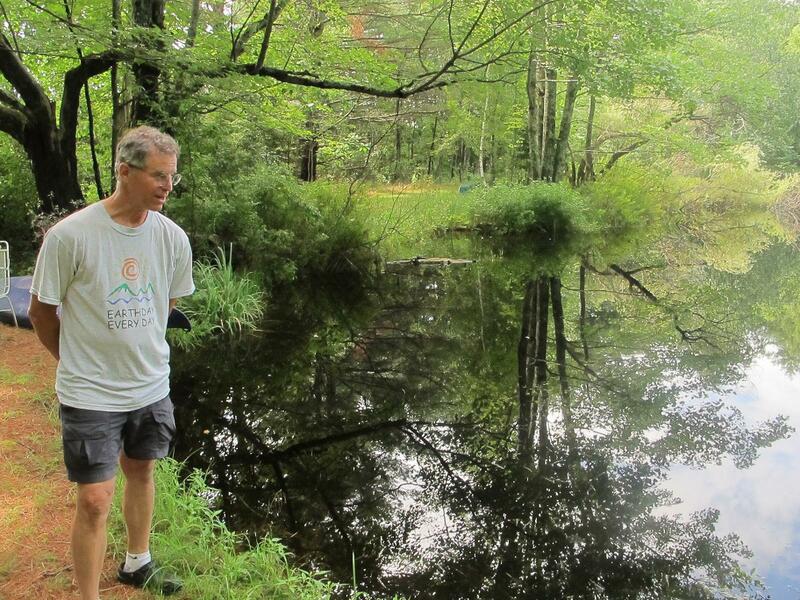 "On June 14, we went to monitor the frogs in the pond and there were about 200,000 tadpoles swimming around," he says. "Twenty-one hours later there were none living, and instead the bottom of the pond was carpeted with tadpoles ready to metamorphose but belly-up. "I think it's the largest die-off of tadpoles known and probably the quickest as well — this happened in a single day," Wheelwright says. "It's a significant number in a couple of respects. One, this pond has no fish in it and that's the reason you can see so many dragonflies flying around and why there are so many frogs, so there are no predators, at least no fish predators in this pond. That leads to very high numbers of frogs." The second reason, he says, is the size of the pond — which he likens to year-round vernal pool, host to a huge population of tadpoles. "When we saw this big die-off, we took samples and sent them to my colleagues at the University of Tennessee, Matt Gray and his team, and they analyzed them for diseases and what they found is that they were suffering from a ranavirus," Wheelwright says. "Rana comes from the scientific name of the group to which the frogs belong. And ranaviruses are an example of an emergent disease. This wasn't even described until the 1960s and not found in the field until the late 1980s, so it's something fairly new, so it's also probably widespread. We know that it occurs in Acadia National Park from some of the work being done at the University of Maine. Who knows how common it is in sites that aren't even being monitored?" Ranaviruses, which Wheelwright says are also a threat to spotted salamanders, can also be spread by other species which are less susceptible to it, such as green frogs and painted turtles — something which is harder to control. "I would say an important thing is to make sure we don't transfer water, and samples and fish and plants from pond to pond because that's a sure bet way to spread the virus," he says. Wheelwright, along with his colleagues at the University of Tennessee, have just published a paper in the Herpetological Review about this unprecedented die-off. This year, he says, tadpole numbers are still down, but don't reflect the level of devastation witnessed in 2013. Nevertheless, says Wheelwright, the whole episode underlines the importance of stepping up monitoring efforts. "Most conservation biologists preoccupy themselves with rare species and try to struggle to save them before they disappear," he says. "One of the things that this study shows is that we might want to be studying a very common species — wood frogs are not at all endangered, in the state of Maine they're one of the most abundant frogs — but here's an opportunity to study the phenomena that drive species from commonness to rarity while they're still common." Wheelwright says this is a call to mobilize Maine's citizen scientists. "There's a wonderful program of monitoring vernal pools done by the University of Maine at Orono, and mostly they look at egg-laying, but maybe we want to be involving citizen scientists to go back to those same vernal pools to see how the tadpoles actually do, just to understand if this pattern of die-off is common," he says. For information about vernal pool monitoring from the University of Maine, visit umaine.edu/vernalpools/index.htm. For tips from Maine Audubon, visit maineaudubon.org/wildlife-habitat/amphibian-monitoring/.